It might sound unusual, but the physics are pretty straightforward. A massive weight is suspended in the mine shaft to capture power and then can be released in seconds. Photos: Courtesy of Charlie Blair (left) / Gravitricity. 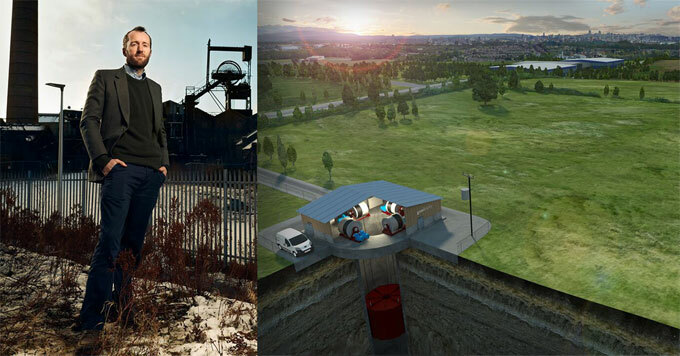 A Scottish company is experimenting with an unlikely place to store energy: an abandoned mine shaft. The technology uses a basic principle of physics: lifting a heavy object requires energy. And, when the object is let go, that energy is released. Charlie Blair is managing director of Gravitricity Limited. He says the system will use a 500-ton weight and store enough energy to power more than 10,000 homes for 15 minutes. Blair expects the company to eventually use weights up to five-thousand tons to store even more energy. And he says, in the long run, they will start drilling their own shafts. Because the availability of sunlight and wind fluctuates, storing energy is critical. Blair says that when scaled up, his technology could help accelerate the transition to a clean energy future.